Vardzia rock-cut monastery is one of the well-known monuments of Georgian architecture. The city is located some 30 km away from the regional center of Aspindza, on the left bank of the Kura River. 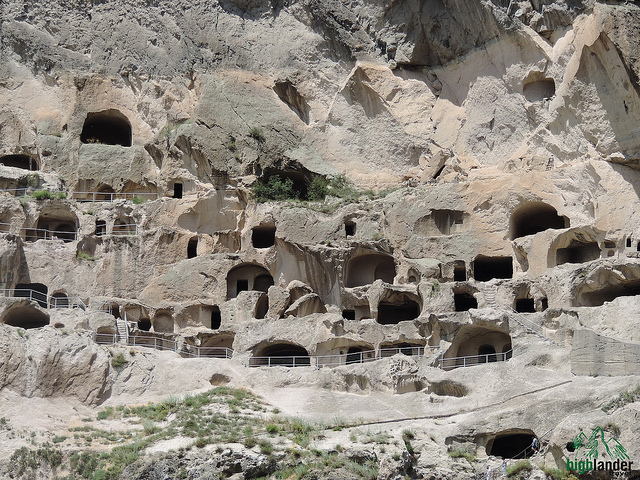 Hundreds of rooms cut in almost vertical rock –sells, halls, auxiliary spaces (for instance a stable),aqueduct arranged on the slope, create the impression as if Vardzia were even a city. The complex was created in the second half of XII c. Commenced by King George III it was completed by his daughter and hair — Queen Tamar – the most famous of all Georgian sovereigns who has almost became the legend during her life. The large single-nave temple dedicated to the Assuimption of the Virgin easily distinguishable from all other buildings is the main construction and the main temple of the monastery. Initially it had a chapel attached from the west that was partially destructed by strong earthquake in XIII c (frontal section of many caves and sells should have been destroyed then as well). An arched wall was built instead, that became its façade. Wall painting of this church performed in 1184-1186 is one of the best samples of monumental painting of those times. Along with religious scenes some portraits of historical persons –King George III, Queen Tamar and a nobleman Rati Surameli are performed there. The chapel is also adorned with wall painting. There is another church in Vardzia adorned with wall painting –so called “Ananaury”. It is a tinny chapel with rather large frontal space (apparently enlarged in later times). Wall painting here can be divided into two segments: — the external and internal. The former is of early XIII c, with the portrait of King Lasha-Giorgi, Queen Tamar’s Hair, while the latter is of the end of XV c, already with Post-Byzantine Features. A ball-tower erected in the center of the “built” architecture of the monastery is another outstanding monument of the second half of XIII century (only the ground floor has survived). Vardzia monastery, famous for its prosperity and riches being accumulated during several centuries was devastated in 1552, when Persian Shah Tahmaz I invaded Georgia. The monastery has never been restored since then, but in the second half of XIX c every now and then several monks lived there. Some traces of revival of the monastery live are noticeable even nowadays.